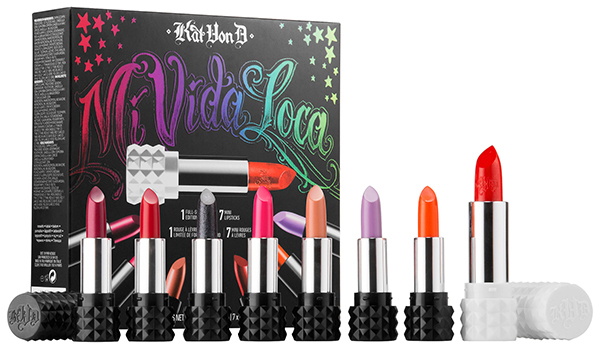 Kat Von D Mi Vida Loca Remix Studded Kiss Lip Set for Holiday 2015 | Top Beauty Blog in the Philippines covering Makeup Reviews, Swatches, Skincare and More! Swipe on bold, eye-catching lip color with coveted Studded Kiss Lipstick. This innovative lipstick is formulated with Color Cushion Technology, which combines long wear, bold color payoff, and ultrasoft comfort for audacious, feminine lip looks. The exclusive new shade, Gold Blooded—a remixed red with subtle gold shimmer, found only in this set — comes in a covetable, studded white casing. This set includes seven mini Studded Kiss Lipsticks in show-stopping shades with attitude. Wonderful!!! I wish them all now! I want those I saw them in my Sephora holiday booklet. I would definitely try out that hot red lipstick! Nice collection. Still can go with the out there colors. Wow, the two in the middle are fantastic! Some of them are really beautiful. The more natural, berry-like shades are so gorgeous in this collection! I wish them all now! Wow amazing products and cool colors! Love the packaging and the shades all look so glam!